All around Marnie, things are disappearing. Her father, a schizophrenic writer, has gone missing.The cats in the neighbourhood, her own Mr. Knuckles included, have vanished. Have they been kidnapped? Or has something scared them away? Marnie could really do with some help from those she loves, but her best friend has her own problems and her sister Jess, seems to be unravelling. What's more worrying is that she's starting to feel a presence - a hot breath on her cheek, a wisp of mane - and it is getting more noticeable daily. Is she imagining things, or has someone - or some thing - come to help her? 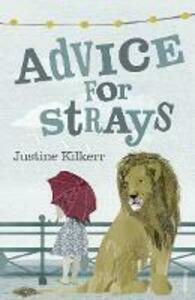 An utterly original and hugely imaginative debut, Advice for Strays is a novel about love, loss, family and a very unusual friendship.